Cut the scampi tails in half horizontally, season with salt and pepper and set aside. Bring a large saucepan of salted water to the boil, add linguine and cook for 7 minutes or until al dente, stirring occasionally. Heat the olive oil in a pan. Sauté the scampi tails with garlic and chilli, tossing quickly and moving the pan around so as not to burn them. Season to taste and squeeze lime juice over top. 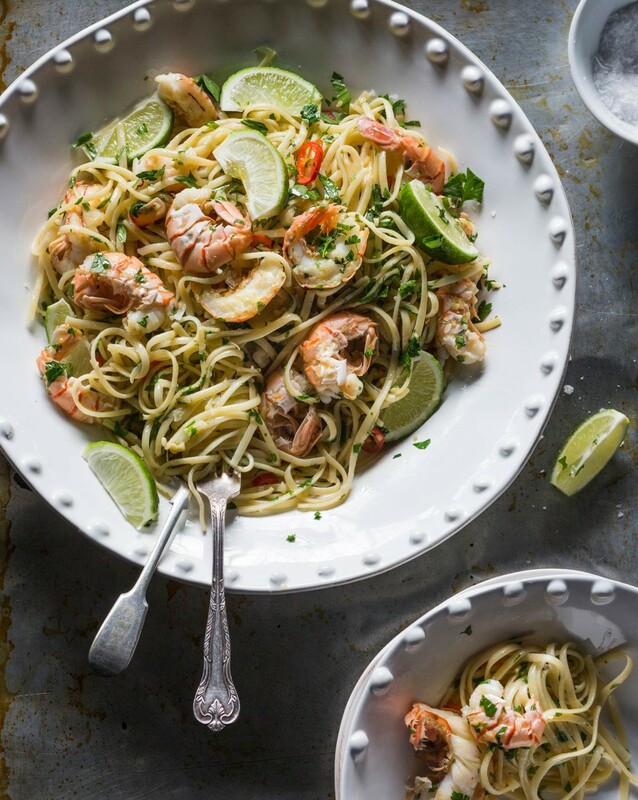 Drain the linguine and add to the scampi mixture, tossing together quickly for 30 seconds, then mix in the parsley. Serve in a large bowl, garnished with lime wedges and parsley. Finish with a drizzle of olive oil. Reproduced with permission from S.P.Q.R. Published by Penguin Group NZ. RRP $60.00. Copyright © text S.P.Q.R, 2014. Copyright photography © Tamara West, 2014. Here's a spring pasta dish that rings all the bells: bouncy fresh, packed with flavour, fast and filling. And good for you.